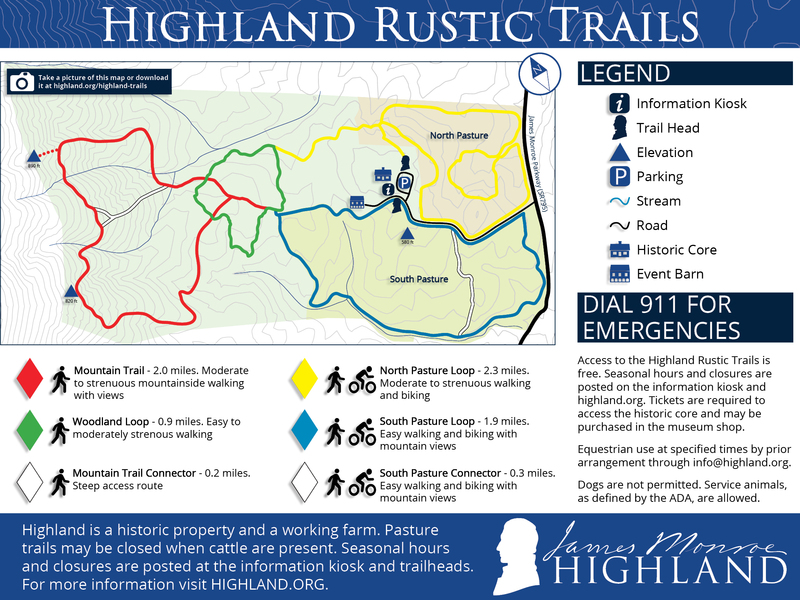 The Highland Rustic Trails are open from 9:00 a.m. to dusk. The Highland Rustic Trails include mountain and pasture loops. Typically the mountain portion and one of the connecting pasture loops will be open regularly; however, at this point both the Yellow and Blue Pasture Loops are closed because of trail conditions and the presence of cattle. The yellow connector is open, allowing access from the parking lot to the mountain trails (Green and Red Trails). Because of the continued frequency of heavy precipitation in the region, we recommend wearing footwear appropriate for wet conditions. Always be aware of your footing and avoid any areas thick with mud. The Highland Rustic Trails wind through the pasture and wooded hillside of the home of the fifth President of the United States. These interpretive trails are free and open to the public! Click to open a downloadable trails map in a new window. Click to open the downloadable rules and regulations in a new window.